They’re everywhere. On the lapels of NCAA basketball coaches during the Final Four. On a FOX reporter’s bowtie during the World Series. On bumper stickers, backpacks, bracelets, beer koozies, tote bags, and the background of a prime-time soap opera. They are puzzle pieces intended to represent autism (and autistic people). "… designed by a [non-autistic] parent … It first appeared on our stationary and then on our newsletter in April 1963. Our Society was the first autistic society in the world, and our puzzle piece has … been adopted by all the autistic societies which have followed." The puzzle piece was chosen, as Helen Green Allison later related, "because it tells us something about autism: our children are handicapped by a puzzling condition; this isolates them from normal human contact and therefore they do not 'fit in'." 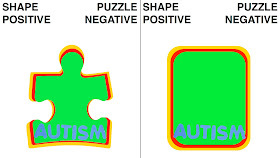 Evoking negativity was, therefore, the primary motivation for using puzzle pieces to symbolize autism. 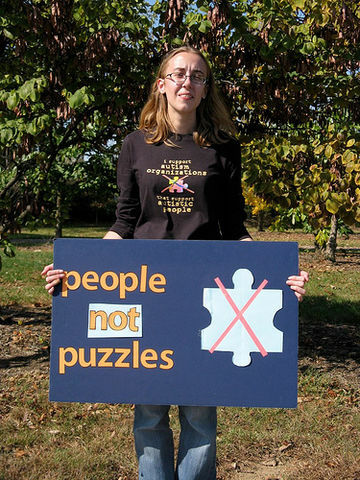 In current day, many autistic and non-autistic people (e.g., Kabie Brook, Judy Endow, Ruti Regan, Alyssa Hillary, C. S. Wyatt, Ed Ised, Autistic Alex, Dan Edmunds, Melanie Yergeau, Adam Thometz, Tim Turner) argue that puzzle pieces continue to evoke negativity. However, other people have suggested that puzzle pieces instead evoke positivity or that the “positives … outweigh the negatives.” Therefore, in a recent study (full manuscript here and data/stimuli here) Bev Harp, Jilana Boston, Jennifer Stevenson, Adam Raimond, and I empirically investigated whether puzzle pieces evoke negativity or positivity in the general public. With a sample of 400 members of the general public, we measured both their explicit biases and their implicit biases toward puzzle pieces in general and autism puzzle piece logos in particular. A bit over half our sample identified as men, a bit under half identified as women, and around 1% identified outside the gender binary. Almost all participants had lived in the United States for the past five years, and they ranged in age from 20 to 75. About 0.5% identified as having an autism spectrum diagnosis; 3% identified as working with autistic persons; 12% as being a friend of an autistic person; and 15% as having an autistic relative. We administered an implicit associations task, which is a speeded categorization task for measuring implicit attitudes (including attitudes toward images of brands). Participants rapidly categorized images of puzzle pieces and non-puzzle piece shapes. On test trials, the puzzle pieces and shapes were paired with either negative words (such as grief or agony) or positive words (such as cheer or paradise). Categorizing puzzle pieces faster than shapes when they were paired with negative words indicated greater implicit negativity. [Image: Pair of example logo stimuli from the study. We also administered an explicit associations task, which is a standard task for assessing explicit attitudes toward brands. Without any time-pressure, participants completed the two sentences: “When I see a puzzle piece, the first few thoughts that come to my mind are ____” and “When I see a shape, the first few thoughts that come to my mind are ____.” Participants were asked to list five associations for puzzle pieces and five associations for shapes, and their associations were later sorted into mutually exclusive categories (e.g., negative associations, such as “problem,” “bad,” and “sad,” or positive associations, such as “fun,” “happy,” and “good”). What were the study’s results? The study’s results demonstrated that puzzle pieces evoke negativity from the public—both implicit negativity and explicit negativity. During the implicit associations task, participants categorized puzzle pieces significantly faster than they categorized shapes when the puzzle pieces or shapes were paired with negative words (t(399)=-7.661, p<.001). A standardized metric known as the Implicit Association Test score also demonstrated that participants’ implicit bias against puzzle pieces, both generic puzzle pieces and those used as autism logos was significantly negative (t(399)=-5.357, p<.001). During the explicit associations task, participants provided considerably more negative explicit associations to puzzle pieces than to shapes (z=4.693, p<.001, d=0.491). 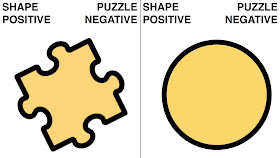 In fact, half the participants’ negative versus positive explicit associations to puzzle pieces were negative (in contrast, only a third of their explicit associations to shapes were negative). Participants explicitly associated puzzle pieces, even generic puzzle pieces, with incompleteness, imperfection, and oddity. What policies do the results suggest? This study’s results suggest that if an organization wants to evoke negativity from the public, using puzzle pieces is the way to go. Puzzle pieces evoke negativity. 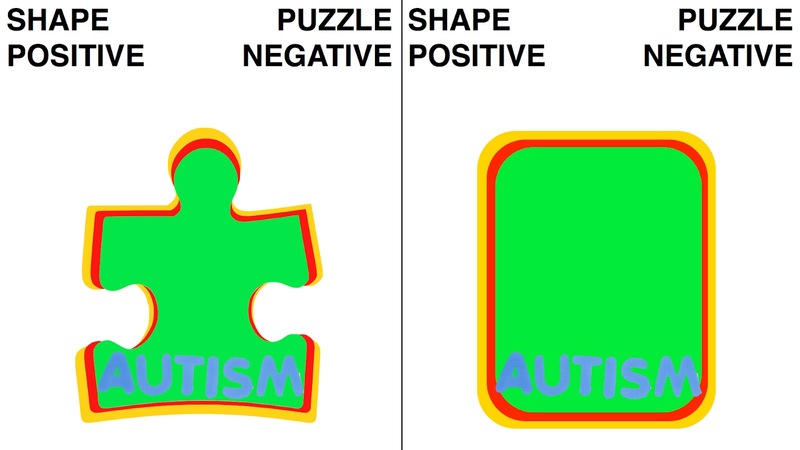 However, if an organization wants to evoke positivity about autism, puzzle-piece imagery is probably not the way to go.